Move More Wandsworth and Enable Leisure and Culture took part in Macmillan Worlds Biggest Coffee Morning last week and raised an impressive £439.64 for cancer support. So far Move More Wandsworth has helped over fifty people living with a range of different cancers and ages from 22 to 82. Participants on the programme have all had different experiences of cancer but Move More has helped them get active in a way that’s right for them. The service starts with an informal chat to discuss people’s personal reason for wanting to become active and make individualised plans. The aim is to help people motivate themselves to achieve their own goals, for some people this might be something simple like walking further without getting tired for others a programme to use within the gym might be recommended. Owen Carter, Macmillan GP for Wandsworth says “More and more research is showing that physical activity can play a huge role in cancer recovery and we now know that the old advice to ‘rest up’ is outdated. The research shows that people who are active manage symptoms such as fatigue and depression much better and are at a lower risk of future health problems. Lloyd, aged 59 from Balham has been with the service since March 2017. He said: “I was diagnosed with chronic lymphocytic leukaemia and started treatment in July 2016. I finished in December 2016 and since then things have been up and down. Getting over fatigue was a huge issue and I still have episodes of tiredness and illness. The whole experience made me evaluate my life and taking care of my own health is now a priority. I have two daughters and two grandsons and I want to be as active as possible for them. Once my treatment was over I was really motivated to get back into fitness as I knew it would help me get my energy levels back. However, getting back into fitness was a big mental challenge. I gained weight after my treatment and my confidence was low. During the session you meet people with all types of cancers. It’s great to talk to people with similar experiences but it also made me realise that everyone is affected differently and you have to do things within your own limits. I always feel better after each session. 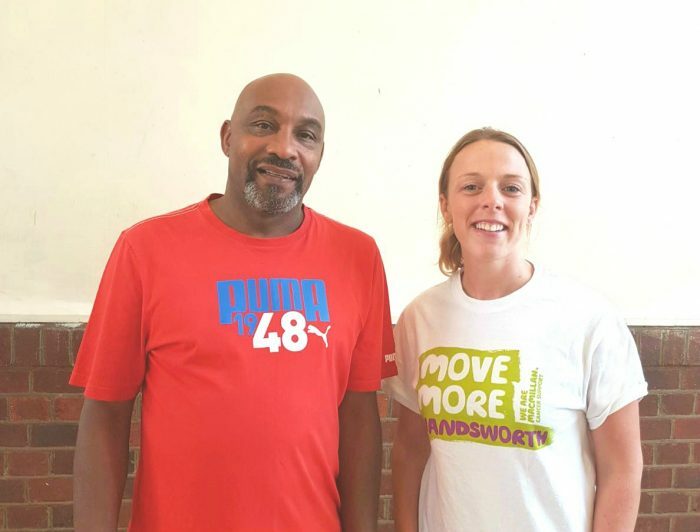 Move More Wandsworth is a service set up by Enable Leisure and Sport in partnership with Macmillan Cancer Support. The service is suitable for people at any stage of cancer, whether still in treatment or on the road to recovery. To take part in the new scheme, or to find out more, please contact Beth Brown, Macmillan Move More Coordinator for Wandsworth on 020 8871 6756 or email waccg.movemorewandsworth@nhs.net. There are 2.5 million people living with cancer in the UK. One in two people are likely to get cancer in their lifetimes. Cancer can affect everything, including a person’s body, relationships and finances. Macmillan Cancer Support provides practical, emotional and personal support to people affected by cancer every year. The charity is there to support people during treatment, help with work and money worries, and listen when people need to talk about their feelings. Macmillan receives no government funding and relies on generous donations from the public. People up and down the country show their support for Macmillan – from hosting or attending a World’s Biggest Coffee Morning to running a marathon or giving up alcohol – so the charity can help more and more people affected by cancer every year. Life with cancer is still your life and Macmillan is there to help you live it. If you want information or just to chat, call 0808 808 00 00 (Monday to Friday, 9am–8pm) or visit www.macmillan.org.uk. Enable Leisure and Culture is a not-for-profit charitable organisation (charity no. 1172345) that manages and delivers the arts, bereavement services, parks, sports facilities, events, film office, public halls, Pump House Gallery and Putney School of Art and Design across Wandsworth on behalf of Wandsworth Council.